The City of Kimberling City’s Jerry Harman City Administrator (left) and Bob Fritz Mayor (right) are pictured above at the Missouri Municipal Governance Institute. 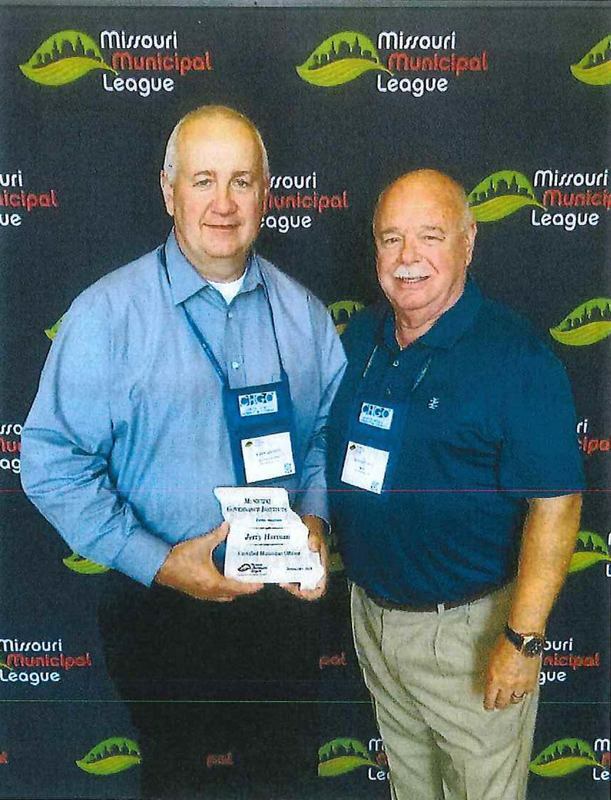 Jerry Harman, City Administrator of the City of Kimberling City, has earned the prestigious designation of Certified Municipal Official from the Missouri Municipal Governance Institute. In 2017, Bob Fritz, Mayor of Kimberling City, also earned his certification as a Certified Municipal Official. Out of over 1,000 municipalities in Missouri, Mr. Fritz and Mr. Harman are one of four in Missouri that have both a mayor and a city administrator with this certification. The Municipal Governance Institute was created under the direction of the Missouri Municipal League’s board of directors, to provide a training program focused on the important areas municipal officials and professionals staff need for success. In order to achieve this high honor, a municipal official must complete 16 credit hours of training conducted or endorsed by the Municipal Governance Institute. Through his attendance at statewide and regional MGI sanctioned educational events, Mr. Harman, has received over 16 hours of training in subjects such as council meeting procedures, parliamentary procedures, the Missouri Open Meetings and Records Law, conflicts of interest, the State Ethics Law, duties of the mayor and council, tort liability, purchasing and bidding requirements, municipal revenues sources, personnel law, emergency management and budgeting. The Missouri Municipal League was organized in 1934 and now serves more than 670 cities as the recognized voice for municipalities in Missouri. This voluntary membership program brings officials of cities and towns together in fellowship of public service that strengthens and guides local government in a progressive, responsible fashion. The primary purpose of the League is to promote understanding of municipal government and administration in Missouri and thereby advance the welfare of the people of this state.